BMW builds SUVs including the X7, pictured, in the U.S.
PARIS -- BMW said the tensions surrounding a U.S. trade dispute with China will play a secondary role in decisions on where it build cars. 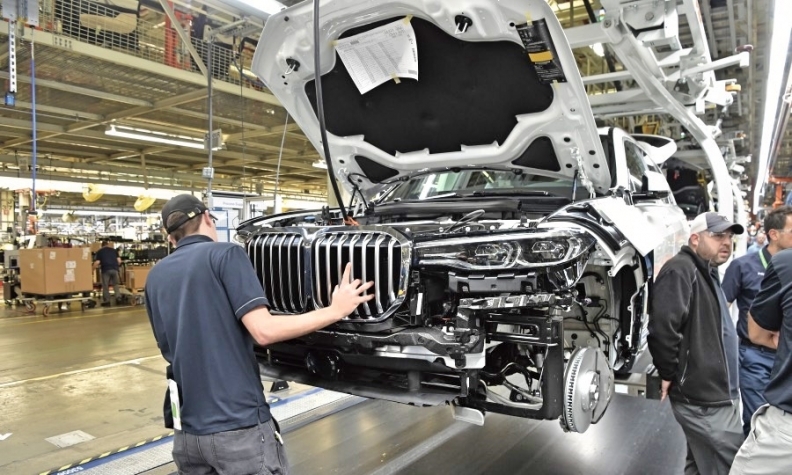 The current spat, set to cost some 300 million euros ($340 million) this year from higher tariffs, is probably temporary, BMW's Chief Financial Officer Nicolas Peter said in a panel discussion in Paris. The company follows demand expectations in choosing where to locate production, he said. "I am optimistic, and I think eventually men and women in charge will realize" the trade restrictions "aren't the best for citizens," Peter said at the event, which was focused on Franco-German relations. "It is not like: 'We invest here because of tariff issues.' It is mostly about whether the market is growing." The luxury automaker ships popular SUVs to China from its plant in the U.S., which have attracted a punitive 40 percent tariff since July. BMW is nearing a decision in the next few weeks on producing another model in China, Peter said this week when the company presented its quarterly results. Peter reiterated a plan to invest $600 million at Spartanburg, South Carolina, the company's largest factory, to boost output to as many as 450,000 crossovers annually. The company started making the X3 SUV in China this year, in addition the several other models like the 1-, 3- and 5-series sedans. He declined to say which model BMW is set to start making locally. Still, other automakers are reacting to the tariffs. Volvo this week said it would cancel plans to export U.S.-made cars to China and vice versa, to focus on supplying the local market.